For fighter info, see Mii Fighter (SSB4) and Mii Fighter (SSBU). For the universe, see Mii (universe). Official artwork of the Guest C Mii from Mii Channel. A Mii is a personal digital avatar character that players can create and use in certain Nintendo games. Miis were introduced for the Wii alongside the system's launch late in 2006, and have since appeared for use on the Nintendo 3DS, Wii U, Nintendo Switch, and even certain Nintendo DS titles and mobile apps. Miis often make cameo appearances - playable or not - in Nintendo games and are sometimes the focal point, such as software like StreetPass Mii Plaza and the Tomodachi series, and gained representation in the lineup for Super Smash Bros. 4, and later Super Smash Bros. Ultimate, eight years after their original introduction. Miis debuted along with the Wii in late 2006. They can be created using the Wii's Mii Channel application, with users able to customize many aspects of their appearance and facial features, such as their height, hair style and eye color. Once created, Miis act as avatars for players in a variety of titles, such as Wii Sports, and as a way of keeping track of individual players' scores. Miis saved onto a console are also capable of appearing as NPCs in games, usually acting as bystanders or spectators. While initially exclusive to the Wii, Miis would also see use in a few Nintendo DS games (the most notable example being the Japan only Tomodachi Collection), and later in several games on the Nintendo 3DS and Wii U, with the latter two being made using the Mii Maker application preinstalled on the system. Miis (bottom) as Friend Roster icons in Brawl. While not playable, any Miis saved on the Wii console could be used as personal icons in the game's Friend Roster. There exist multiple rumors on the inclusion of Miis in Brawl, with most claiming that Masahiro Sakurai did not want Miis in the game, saying "They have an innocent charm to them that could be ruined if they were in a fighting game." No website or print source, however, is known to corroborate these claims. This quote was, however, used when explaining why Villager or another Animal Crossing character wasn't added in Brawl. During E3 2014, when introducing the Mii Fighters, Sakurai claimed that Miis were considered as potential playable characters in Brawl, but were ultimately not included because "it didn't seem right at the time for Miis to be punching and kicking". Mii Fighters as they appear in Super Smash Bros. 4. Miis, under the name of Mii Fighters, are customizable fighters in Super Smash Bros. 4. They can be one of three types: the Gunner, which places emphasis on long-range attacks; the Brawler, with its close-range fighting style, fast movement and powerful physical strikes; and the Swordfighter, the weapons master. Each of the three types have access to twelve unique special moves, and can also be customized with different clothes and accessories. Despite not originating from it, Mii Fighters are counted as a part of the Super Smash Bros. universe. On the fourth and current tier list, which does not take custom special moves into account, the Mii Fighters are unranked, though on the previous tier list, Mii Gunner, Mii Brawler, and Mii Swordfighter rank 54th, 56th and 57th respectively. Mii Brawler possesses good mobility, attack power and speed, yet has a lackluster reach and poor recovery. Mii Gunner has generally quick attacks and high reach, especially with its forward smash and up aerial, yet has a terrible grab game due to a lack of damage and inability to start combos, along with mediocre mobility and lack of ranged KO options. Mii Swordfighter has a disjointed range, quick grab, and versatility in its various special moves, but suffers from a lag-filled moveset and difficulty in KOing. However, the biggest drawback the Mii Fighters have are the banning of custom moves in tournaments, which has been in effect since EVO 2015. Due to this, they are forced to use only their default movesets, rendering their current potential and overall viability poor. As a result, all three Mii Fighter types have some of the worst tournament representation out of the entire SSB4 roster. Mii characters also appear in the background of several stages. In these cases, the Miis featured can either be those already on the console, or random Miis generated by the game. Find Mii: As in the game of the same name, players' Miis appear in cages. Pilotwings: Miis appear in the background of the stage, flying using Rocket Belts. Tomodachi Life: Miis may appear in the rooms behind the fighters. Wuhu Island: Miis appear in the background of the stage playing minigames. Iggy encounters a Mii Brawler member of the Fighting Mii Team. 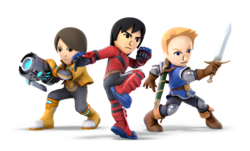 Additionally, Mii Fighters appear as enemies (under the name "Fighting Mii Team") in the game's Multi-Man Mode, as well as the retooled Classic Mode. 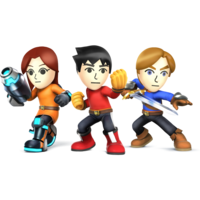 Succeeding the Fighting Alloys from Brawl, members of the team are taken from Miis in the player's Mii Maker, though randomly generated Miis are also present in the mode. All Miis featured as Mii Fighters are randomly chosen to be Brawlers, Swordfighters, or Gunners, but they cannot use special moves or grab ledges. Mii Fighters have a unique costume when fought as part of the Fighting Mii Team, consisting of a black shirt with a large, white M on it, as well as stylised trousers featuring some stripes shaped like the lowercase letter I. These Mii Fighters also do not change facial expression when attacking or attacked, as if the Mii faces are nothing more than masks. Miis are used as the players' tokens in the boardgame-like mode, Smash Tour, simply being used to move around between spaces and collect pick-ups. 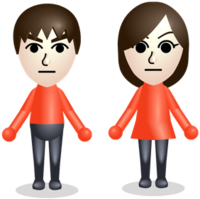 They appear to wear the same outfits that they do in the Mii Maker as opposed to their standard Mii Fighter uniforms, though they will not wear their favorite colors, and instead wear either red, blue, green, or yellow depending on which player or CPU they represent. The Miis that are automatically loaded as representatives for CPUs are chosen at random, and the chances of a Guest Mii being chosen depends on how many Miis have been created on the console in question. This fighter is based on a player's Mii. It excels at fighting with punches and kicks. This type of Mii is very agile, blending attacks with movement to get the battle flowing. It has superior dash and jump compared to other types. Stay close and keep whaling on foes—you'll KO them in no time! A Fighter based on your Mii! Brawlers focus on kicks and punches, and a lot of their specials send them hurtling towards opponents. They're better at dashing and jumping than other types of Mii Fighter, and their speedy attacks really pile on the pressure at close range. And, just for good measure, they can also lob shot-puts! Shot Put is the only projectile attack a Mii Brawler can have. It drops quickly and only bounces a tiny bit. Try using it on foes hanging off an edge to knock them off. The down special Head-On Assault can bury enemies in the ground. It also sends the Mii Brawler downward—don't KO yourself, too! Shot-Put is the only projectile attack a Mii Brawler can have. It drops quickly and only bounces a tiny bit. Try using it on foes hanging from the stage to knock them off. The down special Head-On Assault can bury enemies in the ground. It's also a kind of meteor smash, but if you use it while off the stage, you'll probably KO yourself, too. This fighter is based on a player's Mii and favors a sword in battle. Enjoy the extra reach the sword offers, but remember that it takes a bit longer for strikes to reach your opponent as a result. Customize your Mii with chargeable moves, counters, or projectile attacks. A fighter based on your Mii! The main draw of Sword Fighters is the extra reach that they get thanks to their swords. On top of that, they have a lot of varied moves to choose from. Unfortunately, a lot of sword attacks have a bit of delay between pressing the button and landing the attack, so you'll need to be very careful not to leave yourself open! One of the Mii Swordfighter side specials actually uses a throwing disc called a chakram! How quickly you press your desired direction controls how fast and far the chakram flies and how much damage it does. Several other moves, like Skyward Slash Dash, also work in this manner. One of the Mii Sword Fighter side specials actually uses a throwing disc called a chakram! How quickly you choose a direction controls how far and fast the chakram flies, as well as the kind of damage it does. This kind of quick-aiming action also applies to other special moves, like Super Slash Dash. A Mii sporting a blaster arm, this fighter is a great choice for those who prefer to fight the battle from a distance. The Mii Gunner has a lot of special projectile moves available, so pick your favorites and use them when needed. Don't forget about standard and smash attacks! A fighter based on your Mii! Gunners are all about the guns, of course. No matter how you set up your specials, you'll end up with a powerful arsenal. And it's not just their special moves that have excellent range - they have standard and smash attacks that can really go the distance too. Use them to dominate the battle from afar. One of the Mii Gunner's side specials is Stealth Burst. The missile blends in, making it tough to see. Plus, you can control when it explodes, so it's handy for surprise attacks! You could also use Absorbing Vortex to absorb damage done to you by energy weapons. This is one fighter with a lot of tricks up its sleeve! One of the Mii Gunner's side specials is Stealth Burst. This burst blends in, making it tough to see. Plus, you can control when it explodes, so it's handy for surprise attacks! You could also use Absorbing Vortex to absorb damage done to you by energy weapons. This is one fighter with a lot of tricks up its sleeve! These weak fighters show up in droves in Multi-Man Smash. There are Brawler, Swordfighter, and Gunner types. Since they're based on the Mii characters saved on your Nintendo 3DS system or Wii U console, you could end up battling friends and family! Don't get soft—just take them out! Almost any attack does the trick. These weak fighters show up in droves in Multi-Man Smash. There are Brawler, Sword Fighter and Gunner types. Since they're based on the Mii characters saved on your Nintendo 3DS system or Wii U console, you could end up battling friends and family! But forget that - just take them out! Any strong-ish attack does the trick. Mii Fighters, as they appear in Ultimate. Miis return in Ultimate. Their proportions have been altered so that they have smaller heads. Additionally, they now have 12 different voices to choose from. Each Mii Fighter can choose from one of three sets of special moves. They are once again customizable characters, but are now the only ones with this distinction. Additionally, unlike the previous game, each Mii Fighter class is selected separately on the character select screen, instead of sharing a slot, unless the character select screen is set to stacked mode. Mii Fighters do not appear in All-Star Mode, making them the first and only playable characters with this distinction. As mentioned above, Miis do not actually originate from a game. They share this trait with R.O.B. They, however, debuted in software unlike him, and appear in games based around Miis, such as Wii Sports and Tomodachi. Mii Fighters are the first, and so far only, characters to be counted in a universe they don't star in, in this case Super Smash Bros. instead of their own universe. As a result, they are the first playable representatives of the Super Smash Bros. universe. Mii Fighters are the only characters to start off voiceless and gain a voice in the next game. This page was last edited on April 3, 2019, at 00:54.